Home » VectorVest » Buy Volex #VLX says VectorVest. Improving profitability and visibility is fuelling acquisitive growth strategy. 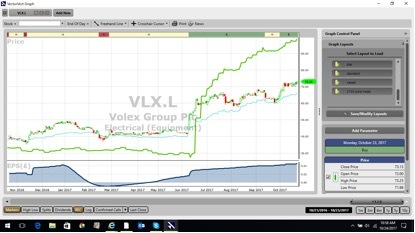 Buy Volex #VLX says VectorVest. Improving profitability and visibility is fuelling acquisitive growth strategy. By Alan Green in VectorVest on 24th October 2017 . Warrington based Volex plc (VLX) is one of the world’s largest manufacturers of premium power cord and harness assemblies. VLX produces and sells electronic and fibre optic cable assemblies, and electrical power cords and harnesses in Asia, South America, North America, the UK, and the other parts of Europe. Its products include power cords, radio frequency connectors, industry standard cable assemblies, radio frequency cable assemblies, and high speed/matched impedance cable assemblies. The company offers its products for consumer appliance and electronic products, data and telecommunications, medical, automotive, off-highway, and industrial applications, as well as for transportation, defence, and aerospace industries. It serves original equipment manufacturers, contract equipment manufacturers, and distributors. On July 25th 2017, VLX held its AGM where the group updated on trading for the 3 months ended June 2017. During the period trading remained in line with expectations, with an improvement in profitability vs. the prior year, as a result of cost cutting actions leading to lower operating expenses. Despite some operational challenges at the VLX Mexico facility, Chairman Nat Rothschild said he believed that cost reduction measures and ongoing operational improvements “should allow us to maintain gross profit margins at a similar level in the year ahead despite commodity price increases. “ Separately on August 10th, Volex announced a strategic partnership with Nexen Tech Corporation, a leading South Korean manufacturer of automotive harnesses and connectors. Group interim results are scheduled for November 10th 2017. The sharp rise in VLX shares in June had been flagged approximately 2 weeks earlier as VectorVest stock graph analysis logged a rise in the GRT (Earnings Growth Rate), when the shares were trading around 42p. Despite the RS (Relative Safety) rating as ‘fair’, scoring 0.90 on a scale of 0.00 to 2.00, VLX still retains a forecasted GRT of 28%, which VectorVest considers to be excellent. With the VST-Vector (VST) master indicator, (ranks every stock in the VectorVest database), also logging a ‘very good’ rating of 1.33 on a scale of 0.00 to 2.00, VLX still remains undervalued at the current 73p against a VectorVest valuation of 99p. The chart of VLX.L is shown above in my normal format. Earnings per share (EPS) is shown in the window below the price. This EPS growth is the engine that continues to push the share price upwards. The share is on a BUY recommendation and trending upwards in what technical analysts refer to as a series of rising price bottoms. Summary: As with so many companies that score highly across the VectorVest stock analysis and portfolio management system, VLX is a well-managed company with a broad and diverse manufacturing base. These qualities have resulted in a significant improvement in profitability and visibility, fuelling the acquisitive growth strategy. With this backdrop, VectorVest sees every reason to buy the shares in the run up to the interim results in November. 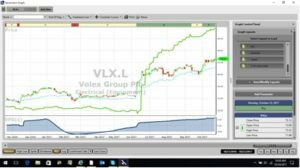 Readers can examine trading opportunities on VLX and a host of other similar stocks for a single payment of £5.95. This gives access to the VectorVest Risk Free 30-day trial, where members enjoy unlimited access to VectorVest UK & U.S., plus VectorVest University for on-demand strategies and training. Link here to view.